A gift is Money or House, Shares, Jewellery etc. that is received without consideration, or simply an asset received without making a payment against it and is a capital asset for the Recipient. It can be in the form of cash / movable property / immovable property. Let us go over some ground rules and scenarios to determine who foots the tax bill, and in what circumstances it is exempt. 1) Gifts up to Rs 50,000 a year: A recipient will not be assessed any tax if the value of gift is less than Rs 50,000 a year irrespective of who gifts the money. But, if the amount is over 50,000 then it will be fully added to taxable income of the recipient. Scenario 1: If the value of gift received is Rs 49,000 then you wouldn’t have to pay any tax on the gift value. Scenario 2: If the value of gift received is Rs 55,000 then total 55,000 (and not just 5,000 which is over the 50,000 mark) will be included in taxable income. 2) Gifts from relatives: While the general rule of Rs 50,000 holds good for any donor in general like a friend, what if the donor is a blood relative? Well in such cases, the total amount received is fully exempt from taxation. Let us understand how it works. Scenario 4: If any of your above relatives gifts you Rs 51,000 then the full amount is exempt from taxation. While the gift received is fully exempt, the income received on it isn’t. In order to check tax evasion and discourage tax evaders from exploiting the loopholes, income tax department further segregates the recipients based on their dependency on the donor. It is called clubbing of income. Income on the gift received by Spouse/Minor Children – If a person decides to gift a certain amount to his spouse, or minor children then any income earned by the recipient on it shall be clubbed with the income of donor. Income on the gifts received by other relatives – In cases where the recipient is anyone other than spouse or minor children, the income generated will be taxed in the hands of the recipient. 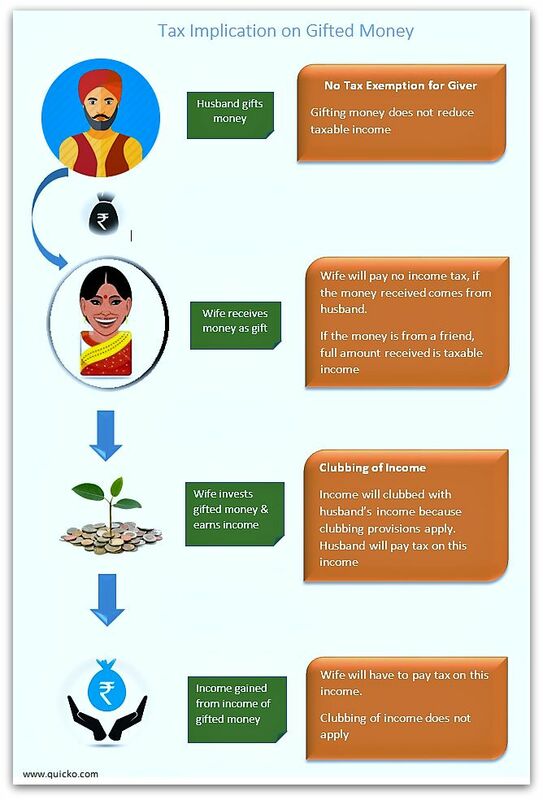 Scenario 5: If the recipient is your wife then the income earned i.e. 50,000 will be added to your income for taxation, and you would pay taxes on that based on your tax slab. However if she reinvests this Rs 50,000 and earn Rs 5,000 (10% of 50,000) as interest, then the income on reinvestment, which in this case amounts to Rs 5,000 will be considered as her own income. Scenario 6: If the recipient is your mother then the income earned will be taxed in her hands. So if she is retired and doesn’t have any other income, then she wouldn’t have to pay any tax as the income would be less than her basic exemption limit of Rs 3, 00,000. The following list of gifts are fully exempted from Tax whether they are received as Cash, or any other form;. Gift received under a Will or by way of inheritance. Gift in contemplation of death of the donor. Gift from any local authority. Gift from any fund or foundation or university or other educational institution or hospital or any trust or any institution referred to in Section 10 (23C). Gift from any trust or institution, which is registered as a public charitable trust or institution under Section 12AA. As per the provision of taxation of gifts, any Gift received from any person on the occasion of the marriage is not liable to income tax. There is no monetary limit attached to this exemption. But, taxes are applicable if gifts are received at the time of Engagement or marriage anniversary. Do you need to report or show the gift received in Income Tax Return? As per the above points any sum received from relatives or on occasion of marriage, is not to be included under the head ‘Income from Other Sources’ while filing your taxes. There is no requirement to show these gifts in ITRs as it does not fall under the definition of Income chargeable to tax. However, if you get a property through a registered gift deed (wherein your PAN is quoted), you can show the value of the gift received as ‘Exempted Income‘ in ITR. This is to avoid any scrutiny by income tax authorities in the future. Also, whenever you receive any gift it is prudent to have gift deed executed. Continue reading : List of Relatives from whom you can take Gift(s) without worrying about income tax implications. Note: The above article has been provided by Quicko.com. Quicko is engaged in assisting in online ITR preparation and filing. You can sign up with Quicko.com and efile your tax returns within minutes absolutely free. The author can be contacted at [email protected]. Sreekanth is the Man behind ReLakhs.com. He is an Independent Certified Financial Planner (CFP), engaged in blogging & property consultancy for the last 9 years through his firm ReLakhs Financial Services . He is not associated with any Financial product / service provider. 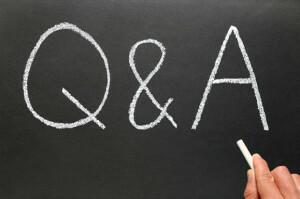 The main aim of his blog is to "help investors take informed financial decisions. ""Please note that the views given in this Blog/Comments Section/Forum are clarifications meant for reference and guidance of the readers to explore further on the topics/queries raised and take informed decisions. These should not be construed as investment advice or legal opinion." Sir, if my fiancee gift my mother (non-working) an amount less than Rs 2.5 lakhs, will my mother be taxable as she falls under no tax slab (my dad is having non-taxable income)? The same amount if my mother gift me, will that be tax exempt as I’m receiving the gift from my mother? Please clarify. The gift amount here is taxable in the hands of your mother, as the gift received by non-family member is subject to taxes. But, if she does not have any other source of income for the said Financial Year then this is below basic exemption limit and her tax liability would be nil. But, its advisable that she get this amount through non-cash mode and declare this as ‘exempt income’ while filing ITR (though this is not compulsory). If your mother gifts amount then it is tax-exempt transaction. Sir, my first cousin, who is an indian resident, and his nri wife jointly owns (no percentage of ownership is shown in the purchase agreement with the builder) a house in India. Now the wife wish to gift her share in the immovable property to her husband. In case the husband sell the same property immediately, what are the income tax implications? Please advise. When did they buy the property? If there is no ownership share mentioned in the Sale deed then by default the ratio is considered as 50 : 50.
if company gifts lets say some 10 lakhs car, is it taxable income ?? If you receive car as a gift from a person, there will not be any tax on it as ‘car’ is not listed in the prescribed list of movable properties as per the IT Act. Related article : Got a Gift? Find out, if it is Taxable or Tax-free? Thank you dear SUNIL ..Keep visiting ReLakhs.com ! If I gift my wife lets say 500000 Rs. which she invests in Tax Free Bonds…Will the interest earned be taxable for me? As per my understanding the answer is “No” but can you kindly advise? The interest income is a non-taxable income, so your understanding is correct. However, if there is a capital gain then such income has to be clubbed with your income and taxes have to be paid accordingly. I want to gift 1,00,000 to my wife who will be investing the same in bonds. The interest income will be clubbed with me. Any income that my wife generates from the interest will be hers. I believe, interest from the bond in subsequent year will also be clubbed with mine. What happens to proceed after redemption of bonds? Will the clubbing provision will apply forever?? Your understanding on ‘clubbing of income’ provision is correct. If you club the interest income (periodically) on Bonds in your ITR then on redemption, there is no income that needs to be reported right. In case, bonds have a cumulative option then interest income on maturity date can be reported in your ITR. I want to give gift of 2l and my wife and she withdraw it and spend it any where then any bills should she keep ? is there any tax ? Dear aum ..No, not required. If possible, she can disclose this Rs 2 Lakh as an Exempt income under ‘Exempt income’ section of Income tax return. Say in above case if wife has her own earning and husband gifted additional money, she spends money = gift received, does the clubbing of income provision apply ? No. Because, no taxable income has been generated on the gifted amount. But how does the IT dept differentiate the spend is from her money or from gift received ? I am planning to gift 15L to my father and then he is going to invest this amount into stocks and mutual funds. Is there any tax implications or this will attract clubbing of profit in my income? Dear Prakash .. It is tax-free…No clubbing of income is applicable. My Friend want to Gift me a Flat of cost Rs.19Lakh (ninteen lac),I would like to know that is it taxable if yes then what is the tax rate for this Gift and what is the proper way to recive this Flat as a Gift. Dear Pankaj ..Yes, you need to pay tax on this Gift as per your income tax slab rate. Kindly read : Gifts & Income Tax implications. I gift Rs 6,50,000 cash to my wife thro bank account transfer. She buys a car with that money. She sells the car after 5 years for Rs 3,00,000. Is there any clubbing of Long Term Capital Loss upon me or upon my wife ? Dear Vivek ..If you are treating the car as a ‘Personal Asset’, you can not claim any LTCL, as it is not a capital asset. My mother sold her property for Rs.36lakhs.The capital gain is around 30Lakhs.She is going to invest this money by purchasing another property for 39 Lakhs in my name (applicant) & wife’s name (co-applicant).I have 2brothers & a sister and they don’t object to this gifting.This will be treated as a gift to me & my wife by my mother.Whether this transaction in any way will attract tax to my mother or my wife. If she gifts to you (alone) then there will be no tax implications to you or to your mother. You may use the gift amount to buy new property. But gift amount given to daughter in law, if invested and any taxable income (for example – rent) is made on the investment then such income is clubbed to your mother’s income and is taxable (if any) accordingly. We are going to stay in this new property and it will not be rented.Hope in this case there will be no taxable income to my wife or mother.Also I want to register this new property in my name & my wife’s name jointly.Is it Ok.The payment to this new property will be made through cheque from my mother’s A/c & accordingly we will file her returns.Whether in my & my wife’s IT return we have to mention about this transaction?. If there is no taxable income then no issues. There is no need to mention about the property transaction (purchase) in your ITRs (self / spouse). But advisable to disclose Gift amount in your ITR as exempt income. May be it is wiser that if your mother gifts the amount to you to your bank account and you use this money to buy a property. In this case she has to pay capital gain taxes (if any) on the sale proceeds (of first property). Another option is she herself can buy a new property with the sale proceeds and later on Gift the property to you. This way she can save on taxes of Long term capital gains (if any). Kindly read : How to save capital gain taxes on sale of property? Sir, my elder son transferred Rs 12lakhs under gift to my youger son to his Bank account for his future benefits . He is filing ITReturns for the income of interest received on it. Transferred amount is from Dubai. Kindly clarify is it taxable. Is there any ceiling for gift by N R I. It is tax-free. Your younger son may declare the gift amount in his ITR under Exempt Income section. There is no limit for Gift per se, but there is a limit in terms of Foreign exchange (limit is $ 200,000). I and my wife are Government employ form 2001. we went canada on permanent visa in 2009 . we lived their more than 2 years. now we return permanently in India and we continue Government job. when we lived in Canada. we do word there and earn some money. some money we bring in India and some of $30000 in remain in Canadian Bank on the name of me and my wife’s name. now we want my money in India to purchase a flat in India. if my canadian bank send me my money by bank draft and i deposit this draft in my Indian Account is it tax able are not. 2 I am buying a flat cost of 6500000. can i borrow some returnable money without interest 1000000 for this purpose from my 3-4 friends. 3 some friend deposit 150000 in my account. is it right ? Yes, you can take a loan from your friends. But suggest you to maintain loan agreement with all of them and do mention the fund transfer details in the agreements. If you have already filed taxes in Canada, I believe that you can transfer the funds to your Indian bank account. However, there can be some NRI tax rules which I may not be aware of, so plz do consult a CA who take care of NRI taxation as well. On 01 April 2014 father gifted Rs 30lakhs to his daughter aged above 18 years. Daughter invested the entire amount in bank FD. She has no source of income other than the interest she earns on FD. She has been re-investing the interest in bank FD. On 01 April 2017 the maturity value of FD will be approximately Rs 37 lakhs. She has been filing her IT return annually. Now can the daughter gift the entire amount of Rs 37 lakhs to her mother who is a school teacher earning Rs 2 lakhs per annum ? If yes, then what is her mothers tax liability ? Yes, she can gift the amount to her mother and it is treated as tax-free one. Her mother may have to pay taxes if her total income (Salary income + any income generated on this gift amount) exceeds the basic exemption limit. Read : Gifts & tax implications (new article). I am looking to invest a large corpus in Equity Mutual Funds by using PAN number of one of my “immediate family” members, though I am not sure legally which scenario is the best to avoid clubbing. I am in the 30% tax bracket, and so is my retired father. My retired mother is in the 20% tax bracket. My wife and mother in law are both housewives though. I understand if i gift it to my wife, the interest from the MFs will get clubbed with my income. I am a wondering if my mother or mother-in-law will be good candidates? Could you please suggest in what way can i gift the corpus to one of them, and not invoke the clubbing of income? Whom should i gift it to? Kindly note that if you gift to your spouse and the amount gets invested in say Equity mutual funds, then any long term capital gains on equity funds (12 months +) is tax free, so the gains even though clubbed to your income is again tax-free to you too. You can also gift to your mother. Then if the LT Capital gains are tax free, is there any advantage of gifting the corpus to my wife or mother? Could there be any issues if I amass the corpus invested against my PAN only? Your mother is a tax assessee, so better option is to gift to your wife who is not a tax assessee (as of now). I dint get this ‘Could there be any issues if I amass the corpus invested against my PAN only?’??? Husband gifts immovable property to his wife . When wife sells this property further, long term capital gain will have to paid by wife or the donor husband. This question is specifically asked for husband wife relation and not for any other relation. Any rental income or capital gain accrued on the property will be clubbed to husband’s income. I have gifted some amount to my sister last year. Can i get interest free loan from her now, which will be returned later. Do i have to make a loan agreement? Is the loan amount to be shown in the ITR? You can take. Advisable to make loan agreement and also receive the amount through banking system (online transfer/Cheque). on my retirement, i bought FDs in the name of my 2 nephews and gifted them (both major). Pl. confirm that they are to pay the tax on the interest income. Also, is there any limit for gifting? Yes, interest income on FDs is taxable income. They may be liable to pay taxes if the total income is above basic exemption limit (Rs 2.5 Lakh). There is not limit as such.. Since they have received gift from me (relative), are they to indicate the gift amount under exempt income. If so, the gift received in the year of filing is only to be indicated or even earlier years. It is optional, but advisable to disclose under Exempt Income section. Gifts related to current FY only. in which section donar is tax exemption ? if I want to gift to my mother for an amount of 1 lack. I am Govt employee. if I gift to my mother for an amount of 1 lack for her living expenditure. is any tax exemptions for me. One can not claim any tax deduction on gifts. It is just that the giver and receiver of a gift does not have any tax implications (subject to the T&Cs mentioned in the article). He also submit it file.farmers r giving some money now where to deposit the money.we all r having 2.5lakhs in our account.is it ok to recieve the money through online transfer.pls give me reply. Online transfers should be fine. Yes, it can be taxable in your hands as the gift received by non-family member is subject to taxes. Also, note that your banker may take Declaration form about the source of this money from you. As it is a high value amount, bank may report this transaction to the IT dept. Dear Sreekanth, I have opened a saving bank account in name of my minor daughter about 3 years back which is operated by me. I am depositing some amount (less than 25,000) each year which comes as a cash gift from relatives on occasions such as her birthday, festivals, etc. I am currently not filing the ITR because my income is less than 2.5 Lakhs. But i am planning to file the ITR from next year as my income is gradually increasing. DO i really need to show the gift of my daughter in my ITR? Or I should leave that and just file the ITR as per my income? Thanks for your response in advance. Advisable to disclose all types of income in ITR. You can show these gifts Exempt Income section of ITR. I am an NRI and say I monetarily help (with no intention to get this money back) a friend in need(for his medical treatment, kinds education etc.) through money transfer from my NRO savings account into his Indian savings account. In a tax year this amount exceeds 50k Rs. My friend is a govt employee too. what kind of tax implications we both should be aware of during filing our taxes. Dear DK..The gift amounts received by your friend is subject to taxes (Entire amount). It will be charged to tax under the head “Income from other sources”. Kindly read more comprehensive article on Gifts & taxes, click here. I am an NRI and if I transfer money say 15 lacs, over a period of three years to my mother’s savings account; in fourth year she goes ahead and buys an agriculture farm with this money, which is registered in her name. if she wills this property to me. what kind of tax implications we are looking at from the standpoint of my mother and myself. Appreciate your CA insight into this. Hi,I have a question…If I invest 1.5 lacs in senior citizen savings scheme in my parent’s name,can she claim tax benefit of 80c for that? ?Suppose her total income from other sources are 3 lacs per annum.Please explain. Dear ..You can gift the amount and let her contribute the amount in her name in Sr.C.S.S. That is exactly my question…do I need to do a gift deed for that or just transfering the amount to her bank account will be enough? ?She will then do a Sr C.S.S from that amount. You can just make online bank transfer and save that statement for your future reference. If I give my parents 2 lacs Rs . Will be tax exempt for me. If yes, how will I show in ITR filing. Dear Nik ..Are you referring to gifting? Read: Gifts & income tax implications. Also, Can you clarify tax implications on investment gains earned by relatives on gifted money. Will they also be clubbed with donor’s income ? If the gifting party, the “donor” in tax lingo, receives something back from the recipient (the “donee”), that portion of the transfer is not a gift. It’s a sale and the income tax system may step in..Kindly check on this with a CA too. Gifts from relatives – Taxed or tax free? Thanks for the wonderful Info. I have a query regarding this. Suppose i gift 5 Lakh Rs to my mother, who is housewife & not working. Now she invest it in FD for 1 year & earned an interest of 40k at 8% per annum. Now what if she want to gift this whole money 8.4 lakhs back to me. What would be tax implications if any ? My father in law (retired) planning to buy axis children’s gift fund in my son’s name from his savings. At present my son’s age is 10 years. This fund will be in the form of lock in till my son attains his age of 18. Please let me know implication of income tax if any in the hands of my father in law or if any in my hands. Children’s Gift Funds – Review. 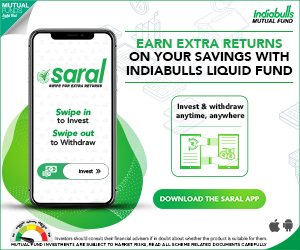 after maturity of fixed deposit i withdrawal Rs. 32 lakh in the f.y. 2014-2015. I want to know how to pay tax if i withdrawal the said money after maturity. ( 10 year old FD). what is the rule of tax in income tax india. Dear Asis..Kindly go thorugh this article : FDs/RDs & Tax implications..
As i said every month i transfer 50000/- to my wife to manage the house hold expenses for last one year. earlier she was earning that time she used to mange on her own earnings. now how she can treat this earning & pay taxes. i had got mutual fund repayment after maturity of rs.13,25,000/- out of that i transferd to my wife 6,75,000/- & balance to my daughter in turn they have put it in Fixed deposit & bank is duducting TDS from the interest. Kindly guide me how it should be treated in there individual accounts for calculating tax for this year. Gift to duaghter is not taxable in your hands, income earned out of it is taxable (if any) in your child’s name . If her basic exemption limit is not breached, she can file ITR and get the refund of TDS (if any). (assuming your daughter is a major). Gift to wife: Income earned on this gift will be clubbed to your income and taxed accordingly. I gifted my wife some money 2 years back which she put in FD. I know that the interest earned has to be declared by me under ‘Income from other sources’. Is she required to declare this interest some where in exempted categories ? If there has been any TDS deducted on your wife’s name, she has to file ITR to get it refunded. Can gift be given to major daughter by her parents. what are its tax implications. In the same way, even the money gifted to major children (above 18 yrs) will not be clubbed in your hand. So in case you have children who are 18 years or older who are either studying or earning at a lower tax slab than you, then gifting your surplus money and investing in their name will neither attract gift tax nor clubbing of income will apply. Income earned out of investments made by your major Children out of the gifts given by you will be taxed in their hands only. Is there any long term deposit available with good rate of interest ? Dear Jasbir..May I know your time-horizon and investment objective (fin goal)?? i would really appreciate if you can answer my query. i am interested in buying tax free bonds that are currently listed on nse. 2). are these bonds listed on bse as well as nse? from where should i buy? 3). what will happen if i keep these bonds in my demat till maturity? i mean how will these bonds redeem? Can you give me the Issue names? Interest income on Regular Bonds is taxable whereas interest income on tax-free bonds is tax exempted. You can buy them through your dmat account.You need to submit the Bonds to the issuer for redemption. if i receive money from any friend or from my inlaws… under which section do i need to keep this amount to get the tax exemption for the same. Dear Ravi..kindly go through the article again. You can make a ‘Gift Deed’ and generally there is no need to mention about the gift value (exempted one) in ITR. Wow,i am loving this page more and more everyday. I received some money as gift from grandparents this week and was wondering about tax implications. Just came to this site and the first article gave me all the facts. Thank you so much. Do share the articles with your friends. What is CRR, SLR, Repo Rate & Reverse Repo Rate?